An other new case study of failure analysis had been published in october 2015 in Case Studies in Engineering Failure Analysis. 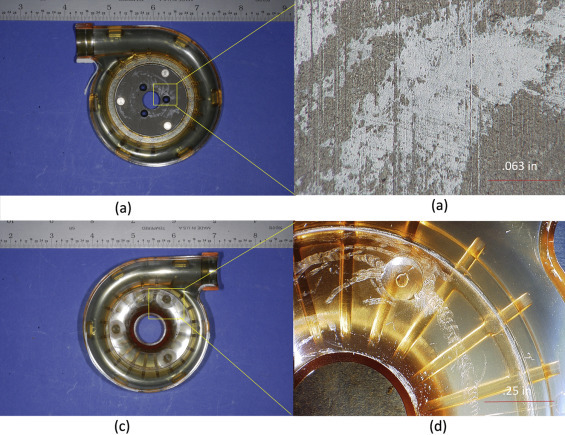 A failure analysis investigation was performed on a fractured polymer impeller used in a respiratory blower. A radial split down the impeller center was observed, with symmetric fracture faces about the impeller bore. The brittle fracture morphology and defects within the impeller bore suggest that premature failure occurred because of multiple interacting factors including: intermittently high centrifugal velocities, imbalance bore and shaft conditions, defects within the bore caused by machining, and stress concentrations along the circumference of the impeller lip. Read more at : Failure Analysis of a Polymer Centrifugal Impeller. Ce contenu a été publié dans Actualités, Etude de cas, Publications par geraldb17, et marqué avec analyse de défaillances, brittle fracture, cas concrets, case study, Centrifugal Impeller, Composites, impeller. Mettez-le en favori avec son permalien.